I’m enjoying time off this month from traveling and speaking. I just don’t get scheduled anywhere. and so many wonderful activities. with my brother and his precious family. and I’m enjoying taking Obie and Amos to the dog park. This is a much-needed break for me. it means no income during the time I’m not speaking. I can send you a tax-donation receipt, because I’m a 501 C-3. I hope you have an amazing Christmas season! Know that I’m praying for you! and who empowers me to live the Christian life. and is preparing an incredible home for me in heaven! I’m so thankful for godly parents who have given me a wonderful spiritual heritage . . .
and share prayers requests and burdens. I’m grateful for YOU . . .
and praying for me when God prompts you. 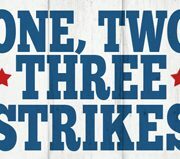 We all know that three strikes = an out. in which three strikes are used. King Joash began his reign as a godly little 7-year-old who had been raised by the priest Jehoida. For most of Joash’s life, he did what was pleasing in the Lord’s sight. It wasn’t hard, because he had his very own priest guiding him. But the end of Joash’s reign didn’t end so well. Joash (also known as Jehoash) visited the prophet Elisha to inquire about Israel’s future. Elisha told him to shoot an arrow to the east indicating victory over the Syrians. Then Elisha told him to take his arrows and strike the ground. King Joash struck the ground three times, then he stopped. We settle for less than God desires. It’s easy to become complacent and indifferent in our relationship with the Lord. We aim too low spiritually. instead of moving in dynamic spiritual growth. The enemies of God (Moabites) would soon invade Israel after this event. When we stop too soon, we can cause the church (God’s people) to move backward instead of forward. Israel would now begin to worship idols again. God’s people would spiritually deteriorate. Guess who NEVER stops too soon? after the priest’s death, Joash turned to idol worship. When Jehoida’s son tried to get King Joash back on the right path, Joash sentenced him to death by stoning him. Without God’s support, Joash didn’t have the military success he once had, and he was seriously wounded in battle when defeated by Syria. Not long afterward, King Joash was assassinated in his own bed by three of his officials. Let’s not make the mistake of taking a wrong turn off of the narrow road that Jesus describes in Matthew 7:14. Let’s determine together to be diligent! and who will live with a faith that moves mountains. Will you join me in answering this call? schedule extra events during the Thanksgiving and Christmas season. I’m not excited about no income coming in during the next month. The Christmas season can be a tough time for evangelists. Real Truth, Real Fast . . . Coming Soon! about and would appreciate you helping me pray about the content. want to motivate us to always go deeper in our relationship with Christ. I’ll also continue to send out my little email devotional blog. tremendous things during these renewal weekends. I will send you a tax receipt, because I’m a 501 C-3. I would especially like your help in growing my Youtube channel. and channel with your friends? That would be a big help! Please know that I love you and pray for you! http://susieshellenberger.com/wp-content/uploads/2016/04/susielogo-300x93.png 0 0 Susie Shellenberger http://susieshellenberger.com/wp-content/uploads/2016/04/susielogo-300x93.png Susie Shellenberger2016-11-16 12:11:212016-12-16 12:11:48Real Truth, Real Fast . . . Coming Soon! When a dead man’s body was quickly tossed into the same grave as Elisha’s bones, the dead man immediately came to life, stood up and walked out of the cave-grave. It’s a fascinating two-verse story found in 2 Kings 13:20-21. Last week I mentioned that we can learn three important things from this little story. See last week’s blog for the first two. We’ll end the story with this final thought that we can apply to our lives. Thing #3: God is using this truth to awaken US today! Think about it: Have you ever made a dead man come alive? Each one of us who have a genuine relationship with Christ should be reflecting His Spirit in our lives so much so that when non-believers come in contact with us, they can see Christ exemplified. Are we seriously walking in the power of the Holy Spirit? Are we bringing others into the knowledge of the resurrecting power of Christ? Christ is still raising the dead. And I’m convinced He wants to raise the spiritually dead people—who come in contact with us—to life in Him. I’m speaking in Fairfield, OH this weekend. It’s connected to Cincinnati. Thank you in advance for your prayers of God’s blessing and ministry! After Elisha the prophet was buried (and a few years had gone by), some Israelites were burying a man but noticed a gang of raiders quickly approaching. Knowing time was short, they quickly tossed the dead man’s body inside the tomb of Elisha and ran for safety. The body of the dead man touched Elisha’s bones . . .
and that’s where this little two-verse story takes a fascinating turn! Coffins weren’t used by the Jews. like those found in our modern-day cemeteries. and the mouth of the cave was shut by a large stone. What can this interesting little story teach us? “double portion” of the power that He had given to Elijah. and peaceful passage to eternal life. We don’t need to fear death. We will live forever with Christ. And Thing #3? Ahhhh. That’s coming next week! I’m speaking in Nixa, MO. Thanks so much for your much-appreciated prayers! http://susieshellenberger.com/wp-content/uploads/2016/04/susielogo-300x93.png 0 0 Susie Shellenberger http://susieshellenberger.com/wp-content/uploads/2016/04/susielogo-300x93.png Susie Shellenberger2016-11-03 09:04:092016-10-27 09:16:28The Walking Dead?